It you go to any farmers market you will know by the bright reds and the deep blues that Summer berries are ripe and in season! This sinfully delicious and light Mascarpone tart is an homage to the beautiful berries that mark the beginning of Summer! In a food processor add the All Purpose Flour, Salt and Confectioners Sugar and pulse to combine. Place dough into greased tart pan, making sure to press the dough out evenly all the way up the sides of the pan. Place in a 375 degree oven for 25 minutes or until golden brown. The pastry will puff slightly while cooking, when out of the oven take a measuring cup and pat the crust down while still hot. Sit aside to cool completely. 2.The Filling: In a stand mixer with the whipping attachment on high, whip the egg whites and the 2 tablespoons of sugar until the whites almost form peaks, remove from mixer bowl and set aside. In mixer bowl with the paddle attachment, mix the mascarpone cheese, 3 tablespoons sugar, Lemon zest, Lemon Juice, 1 tsp Vanilla extract, 3 egg yokes until smooth and silky. When smooth gently fold in the egg whites into the mascarpone mixture until just combined. When the tart shell is completely cool add the filling to the tart, it should almost come to the top of the tart shell. If you have a pie crust cover you can put it around the exposed pie shell, if not cover the exposed shell with a little aluminum foil to keep from burning. Place carefully into the oven and bake for 30 minutes or until the filling has come together. You can test this by gently shaking the crust, it the filling only moves around like jello it is finished. Remove from the oven and place in the refrigerator until completely cool. 4.The Topping: When the tart is completely cool, remove it from cooling. Take your strawberries, remove the tops and cube them to the size of the blueberries you have. In a bowl combine the strawberries and blueberries and toss with a tablespoon of lemon juice. Take these berries and spread them evenly in a single layer over the entirety of the tart. Make sure every bit of the tart is covered. 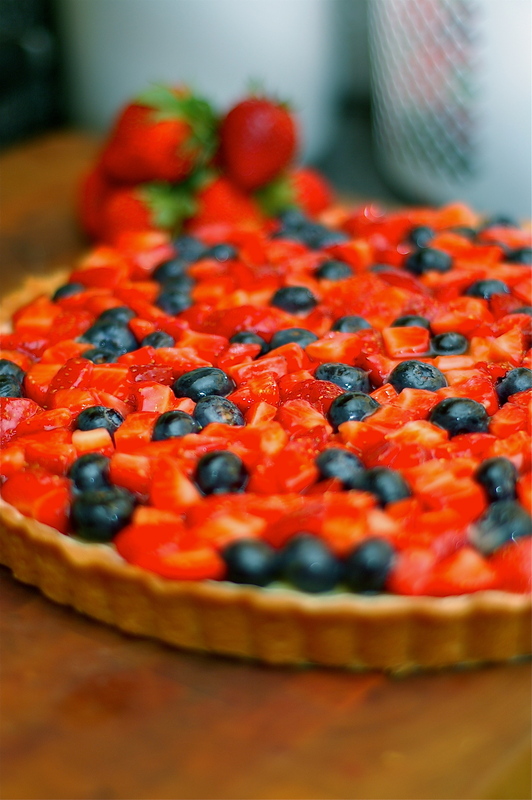 Gently press the berries into the surface of the tart until it is flat and even. In a small microwave safe dish combine the apricot jelly and the water and microwave for 1 minute. Take this mixture and, with a brush, brush it over the top or the entire tart. This will seal in the fruit and create an attractive sheen! This entry was posted on Friday, June 3rd, 2011 at 9:43 pm	and tagged with Baking, Birmingham, Blueberry, Dessert, Light, Recipes, Strawberry, Summer, Tart and posted in Uncategorized. You can follow any responses to this entry through the RSS 2.0 feed. I made this for a summer neighborhood party and it so yummy but also so very beautiful. Just so you know, the egg yoke for the tart part is not in the list of ingredients, though it is mentioned in the directions. I’m assuming it is one egg yoke. Thanks for sharing this recipe.